Can you guys tell what I am doing here?? Cookout/picnic/warm weather/fun time food!! Please tell me you guys are all on board with this?? Like please? Cause I have caught the warm weather food bug and I am pretty sure there is no turning back, like none. The fresh, summertime, fun food is here to stay and man, I am so excited. Also, ice cream time. Yes, yes, yes to ice cream!! So along with delicious summertime foods, and the warm weather that is sure to be upon us soon (please tell me when I get back – I will explain below – that we will have magically morphed into full on summer) comes new animals on “the homestead”. Things are getting kind of exciting around here. I know, I know, I’ve already told you about the goats, which I think will be arriving this weekend (a little bit of a bummer since this weekend I will be out-of-town, BUT very excited to see them when I get home), but now there is also the possibility of a few horses coming to board with us this summer. YES!! Horses! Like every little girl’s dream (and in my case big girl’s). With that said, there are still a lot of details to be worked out. Horses are a lot more work than chickens and goats (not to mention more money) but this summer we would actually just be boarding three horses for someone else. They would leave in the fall 🙁 but it would be a great trial run to see if we (meaning my dad…who should probably just quit his day job already and become a professional dishwasher/farmer/handyman) can really handle horses…along with the chickens and goats we already have. Like I said though, this one is still only in the discussion phase. The fellow (<–look I am so grown up) who is interested in boarding his horses here is coming over today or tomorrow to chat, so we will know more details soonish. Fingers crossed though. Oh, and clearly this is the reason for my Pinterest horse photo binge the other day. Sorry, well not really. I feel like updating you guys on life today…but um, my life is really not all that interesting, and all I have to chat about are the facts that I am excited the grass is finally getting green, horses may be coming, the goats ARE coming and a sunny Cali work trip begins tomorrow. Oh, but the Cali work trip?? Any of you LA people have suggestions for me? Places to eat? Things to do? Possibly the best secret antique prop shops (think dishes and old vintagey things) that I just HAVE to hit up?? I will also be heading down to San Diego, so if you know of some great shops down there as well, PLEASE… share, share, share! Would LOVE any and all input on this. I head out tomorrow on an early AM flight, so I am currently in the frantic state of “oh my gosh, I have so much to get done in the next 16 hours – help”. It’s so much fun – NOT. 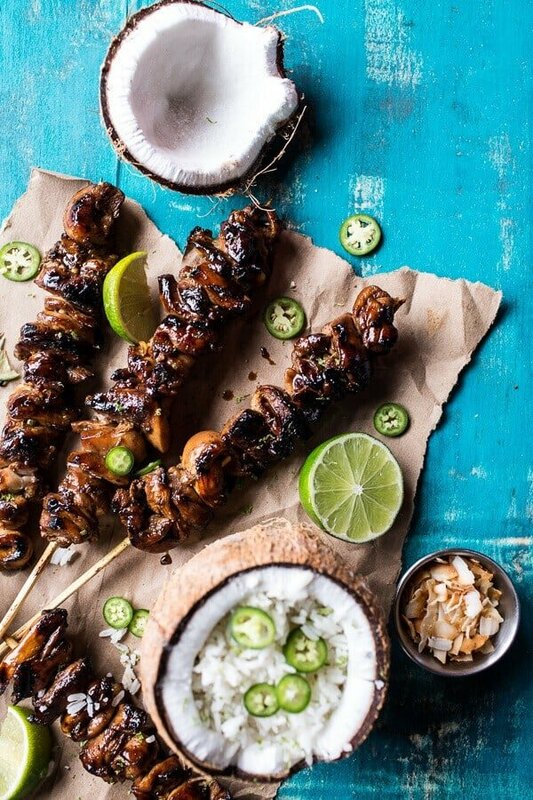 Ok, life matters all summed up, on to these coconut honey lime Filipino chicken adobo skewers. They’re kind of fun, right?? I mean, I totally regret my styling decisions here in these photos, because now all the colors just annoy the heck out of me and I hate looking at them, but then again, I hate almost all of my photos. Why is it that we are our hardest critics? I mean, it’s really just no fun. Aside from the photos, this chicken is so delicious. Super easy and perfect for the upcoming Memorial Day weekend plus equally great throughout the rest of the warm summer months. 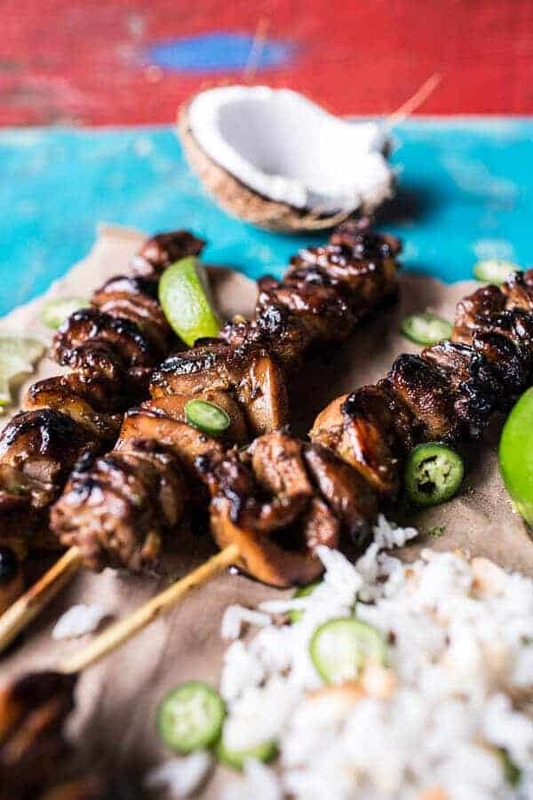 Traditionally, Filipino adobo chicken is not grilled or made on skewers, but something about food on a stick just makes me happy. I think it’s the kid inside of me trying to break through my tough as nails, no fun skin (harsh, but sort of true). Or maybe, I just like the idea of not having to mess with cutting up my chicken, because when it comes to food, I want it in my mouth. Messing with knives and such just plain annoys me. Wow, I think it is clear that I have like zero patience. Maybe I should work on that? Ok, but in all seriousness, I adore this chicken. It is so flavorful and so quick to prepare. 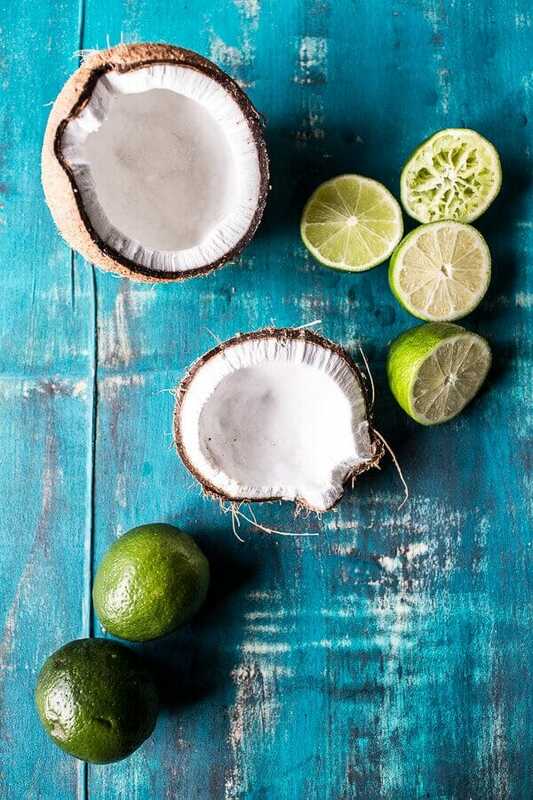 It’s slightly sweet and tangy with a nice fresh hint of lime. SO GOOD. I served my chicken with a side of coconut rice and a fruit salad. Perfect for a quick meal or simple entertaining. Add the chicken to a large bowl or gallon size ziploc bag. In a blender, combine the soy sauce, coconut milk, juice of 2 limes, rice vinegar, honey, garlic, ginger and black peppercorns. Blend until smooth. Pour the marinade over the chicken and the bay leaves. Cover the bowl or seal the bag and place in the fridge for at least one hour or overnight. Preheat the grill or a grill pan to medium-high heat and lightly oil the grates. 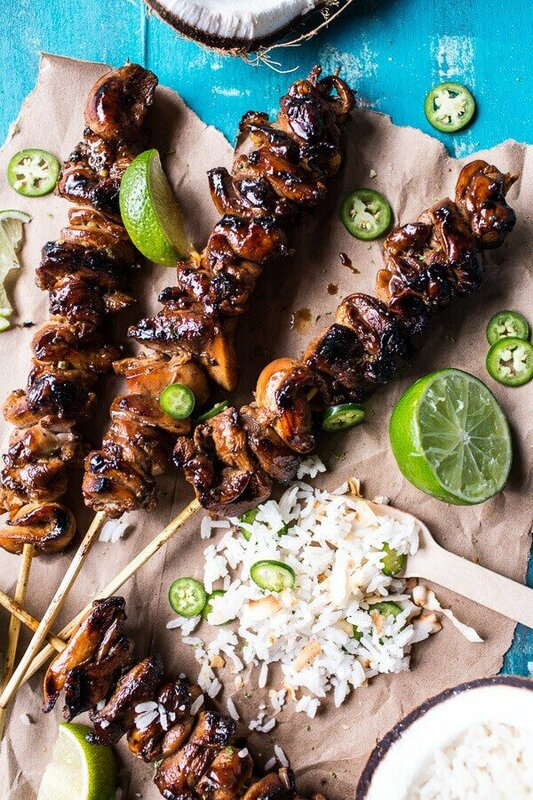 Thread the chicken onto metal skewers (or wood skewers that have been soaked in water). Place the chicken on the grill until the chicken is golden and no longer pink in the center, about 5-10 minutes each side. You may also cook the chicken in a skillet if needed. While the chicken is cooking, I like to add the reserved marinade to a small sauce pan, bring it to a bowl and cook about 5 minutes or until reduced to a sauce. 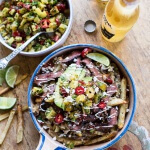 Serve the chicken with the sauce and the [coconut rice | https://www.halfbakedharvest.com/hawaiian-hula-pork-fajitas-pineapple-slaw-coconut-rice/]. PS. Are the coconuts giving off summer vibes?? Please say yes. 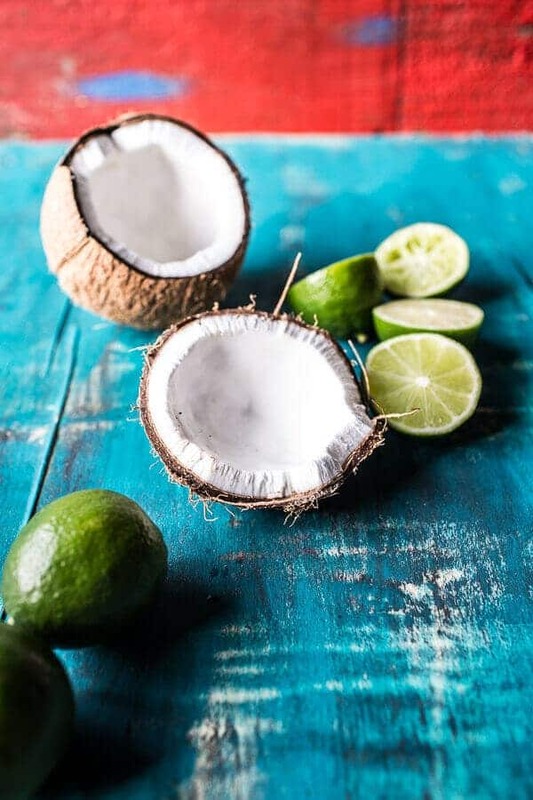 Coconuts all summer long please! Let’s Go on a Mid Summer Hike Together! 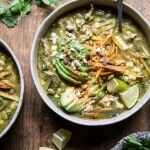 Crockpot Salsa Verde Chicken Pozole. Awe!! THANK YOU!! Oh and I would so trade places with you, the heat sounds amazing! Hahaha I know right! 🙂 I would definitely trade places with you….. if i have enough money to go and fly there =)) haha…. the heat really sounds great at first, but if you’ve been living here for 19 years, then you’ll probably go tired of the heat of the sun. Divine !!! 🙂 These look so yummy…. I’m with you — 100% on board for fun summertime eats! These look like the perfect place to start. YEAH! Thanks Rachel! Hope you had a great day! Have fun on your Cali trip! This chicken recipe tho – this looks like it’s going to be summer grilling favorite around here! And the coconut rice ? well you already won me over with that! Thank Kathy!! Hoping you had a great week!! These look so fun Tieghan! And so delicious! I am looking forward to the fun foods of summer too! Have a great time on your trip! These are perfect and we will be making them. So gorgeous! Thanks so much, Lynda! Hope you love he skewers! Next beautiful weekend night – I’m going to be all about these. And the colors are gorgeous! Hope you love the skewers!! Regret your styling decisions? I’m convinced you could not make a wrong decision in that arena Tieghan and this is perfection. Sets such a fun tone for the skewers. Love the rice in the coconut. Enjoy sunny and hopefully warm California! Our Colorado spring is certainly not that, at least in Boulder! I agree! Your photos are beautiful, creative, and with a wonderful sense of color. They have also evolved over time, and I love your use of different props and flowers, etc. Hope you have a lovely trip! Thank you so much, Terry! You guys are putting a huge smile on my face tonight!! AWE! Wow, thank you so much for the kind words!! Some here in Summit, we have had cold temps and rain/snow for weeks. UGH! That chicken looks so succulent and flavorful! How serendipitous that I’ve got a few extra limes sitting around from a recipe the other day…hello, dinner! You just come up with the best recipes! i want to eat this RIGHT NOW!! I think every single one of your photos is absolutely stunning! THANK YOU! That is so kind of you to say! Hope you had a great week! I think your photos are all absolutely stunning! Every time I look at your recipes I am so impressed and wonder how you make food look so great. I was just thinking how you should make a cookbook (I know easier said then done!) but I would be first up to order that! Your blog and Garden Betty’s are my two favorite out there. You both inspire me to cook out of my box, especially with vegetables! If you haven’t read Garden Betty’s, I’m sure you’d love it. I have her cookbook that just came out and I’d love to have your wonderful recipes and beautiful photos in a cookbook as well! It seriously would be beautiful enough to be a coffee table book. Skewers are LIFE! It’s why I love Filipino and Brazilian food! 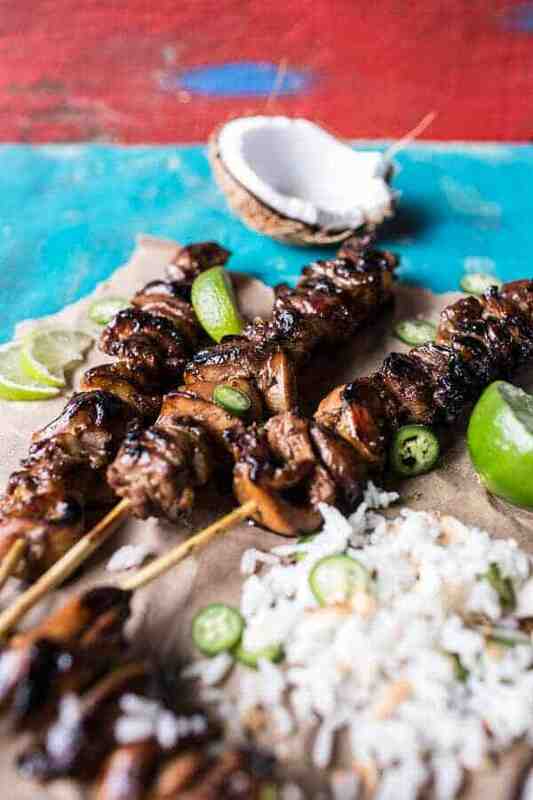 Do you have a satay recipe? AGREED!!! No satay recipe…yet!! Maybe soon though! 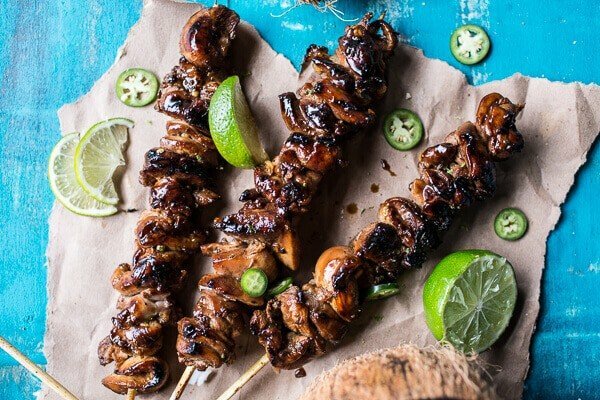 I do have a lot of peanut chicken recipes and a few other skewers recipes as well. I agree with several of the other commenters: your pictures look beautiful/coffee table book worthy (like, one of those books that people just stare at and drool over and silence falls on the room because all your guests have fallen into a food coma 😉 ). In fact, I had just been thinking how your pictures are always so gorgeous and I was just loving all the bright colors!! Whoa! My mom’s from the Philippines, so growing up, I used to have chicken adobo for dinner on an almost weekly basis. Not like this though! Love the fusion! Love the backdrop in these photos! You’re right so summery, and tropical! Especially with that coconut! Guisado’s Tacos on Sunset (also Echo Park) will blow your mind. check out the Grand Central Market downtown. In San Diego, there is a cool arch salvage place in the Design District near Little Italy. Going to make this incredible looking chicken this weekend! Thanks for the great looking recipe! Thank you so much for these suggestions!! I am so exited to check them out! Have a great weekend, Anna! We feel a bit like a broken record, but geez this looks good!!!!!! Thanks for another inspired recipe! I don’t know what you’re talking about with your photos– they are some of the best on the web– p.s. that’s one reason I love your site so much.. consistently amazing photography and it blows my mind how you continue to do it day after day. Keep up the great work and have fun on your trip to Cali! Oh my gosh, THANK YOU! That is so incredibly kind!! If you get to Santa Monica go to Sunny Blue- they have awesome Omusubi (there’s also one in Culver City) For Burgers Fathers Office or Plan Check, Gingergrass (Vietnamese Food) in Silver Lake, Sugarfish , for Sushi (they have a few locations) and if you’re downtown Kazunori – this is Sugarfish’s all hand roll restaurant. For Ramen- Jinya or Tsujita. Thank you so much. I going to cook on my weekend. My favorite mexican place is called Tere’s and it’s on Melrose near Rossmore. I usually get their carne asada burrito or their chicken tinga nachos. SO GOOD. they make their own tortillas and tortilla chips, which makes suuuuch a difference. There’s this delicious pub burger in downtown culver at City Tavern. My absolute favorite frozen yogurt place is called Yogurt Stop in WeHo. I don’t know if they have the salted caramel flavor but it’s AMAZING. as is the toasted masrhmallow and every other flavor they have. It’s fro yo but it’s more like soft serve ice cream in flavor/texture. Lemonade is a small chain in LA but they have delicious food that you pick and choose from – like if you want 2, 3, 4 portions (and you can get different things). So good. Also In n Out. Because, well, in n out. What a great grilling recipe, can’t wait to try it. I know what you mean about horses, when I was in Canada horses were my life, would love to have one again! Have a great trip! Believe me your photos are inspiring. I made these skewers for dinner last night. They were awesome! Made this and the coconut rice for dinner.. AMAZING !! You have a gift! Summertime food is *the* best. 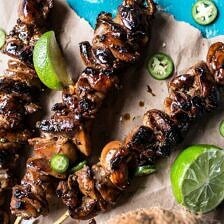 I just love these skewers! These were really yummy! Thank you for all the great recipes, I can’t wait to try the s’mores calzones. Oh and I just added some jalapeno slices, no special recipe. Awesome! I made this tonight for my family hopefully it will be a success. Cheers! Where are your contat details though? Yum! These look so good, and your pictures are beautiful! Did you put any pepper in the marinade or just topped with the jalapeño? 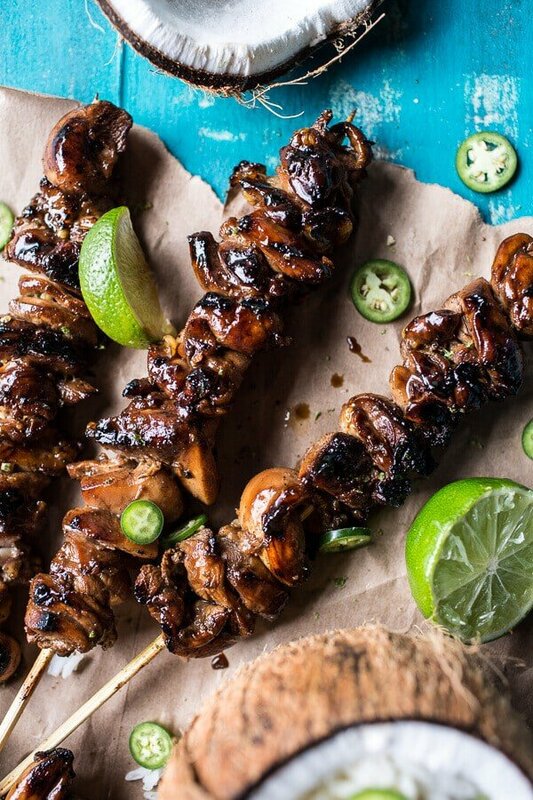 Can you marinate them with the skewers in already? Can these also be made in an oven?? If so, at what temperature and for how long? Thanks! Yes, you can make these in the oven. Roast at 450 for 25-30 minutes or until cooked through. Hope you love the recipe! I have made this several times in the last month or so and it is one of my new favorites. Everyone in my family loves it (including my Mother, who will not eat anything that isn’t meat and potatoes (she’s from Ireland). 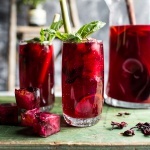 I love your blog and am looking forward to trying more of your recipes. Congrats on the book, the completion of the barn (looks gorgeous) and the article. I’ve used this recipe twice. The first time I halved the recipe for just a weeknight dinner the second time I doubled it for a party. The chicken disappeared within minutes both times. I strayed from the recipe a little. I didn’t grill, I used the broiler in my oven using the same cooking times. I also used Filipino palm vinegar instead of rice vinegar and tamari instead of soy sauce. The chicken still came out tender and flavorful. The only addition I would make is to baste the chicken with sauce after the final flip. That will help the flavor stand out and make them moist and glistening like in the picture. This is not a traditional chicken adobo recipe with ingredients like coconut milk, lime juice and honey but it worked very well for this application. Thanks for posting this. So happy you love the recipe!! Happy 2016! Have you ever considered about including a little bit more than just your articles? I mean, what you say is valuable and all. But think about if you added some great images or videos to give your posts more, “pop”! Your content is excellent but with images and video clips, this blog could certainly be one of the best in its niche. Excellent blog! Just made this tonight and it was amazing. I was only able to marinate the thighs for 3 hrs, but they were still super flavorful. I bumped up the recipe to 3 lbs and had plenty of marinade in a bag. Otherwise I followed the directions exactly with no other modifications. Everyone loved it, even the picky 8 year old and 4 year old. Will make again! Thank you Rebecca! I am so glad you loved this!